We arrived in Santa Rosa, CA on Friday November 6th and set up camp on the street in front our friends, Tom and Sally’s, house. They live on a nice wide quiet street where no one objects to folks camping on the street—something we don’t do very often. In fact, this was our first instance of ‘driveway surfing’ since we got Genevieve. She’s pretty big so she doesn’t fit in most folks driveways! Friday evening, Sally outdid herself with a fabulous meal and we had a great time talking about old times. We’ve known Tom since our days in community in Massachusetts back in the early 1980’s. We only met Sally a few years back but it feels like we’ve known her for years. Saturday morning, Tom got up at the crack of dawn (6 am) and started a couple of batches of rye and sprouted wheat sourdough bread. This is a non-yeast sourdough so it takes lots of time. Then in his spare time he made whole wheat pancakes for us all. (These folks really know how to feed their guests). We hung around their house in the morning as he ‘babied’ his bread. Walter took the loppers to some brambles along their back fence so we could all go down and have a look at their dry creek—which they expect with El Nino, will be very wet this coming winter. Then once the bread was in the pans, we went over to pick up a picnic at the local Italian Deli and headed out to Crane Creek Regional Park. We found some picnic tables and had out lunch and then took Toby (their very sweet Golden-Doodle) for a walk in the rolling hills of the park. 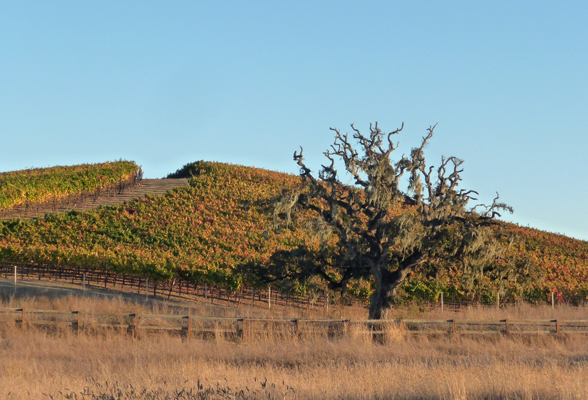 The park has houses up on the hills overlooking it and as in all open country in these parts there are vineyards too. Here’s the view from the trail looking out over the neighboring vineyards. Sally likes this place because it reminds her of the rolling hills of her native Kansas. There were folks out playing disc golf and having engagement and family portraits taken. In fact, things were so busy we had to park in the overflow parking lot. 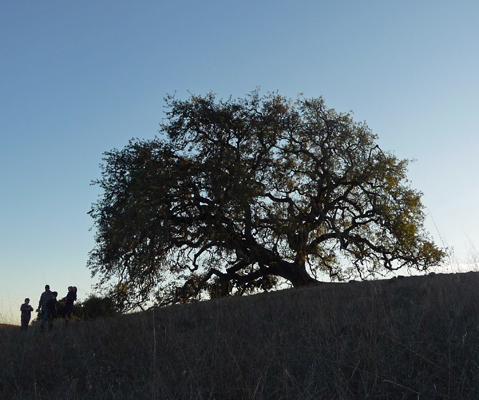 The huge old Live Oaks made a great background for photos. It was a lovely afternoon with golden autumn light. That evening we had yet another fantastic meal with lemon/rosemary sourdough and garlic sourdough fresh out of the oven (for desert because the rise took a little longer than expected). The bread was divine and is so rich and dense it’s practically a meal in itself. Tom sent us off with the rest of the lemon/rosemary loaf when we left—it’s marvelous. The next morning (after eating yet another incredible meal with Tom and Sally) we headed south to San Francisco Bay. 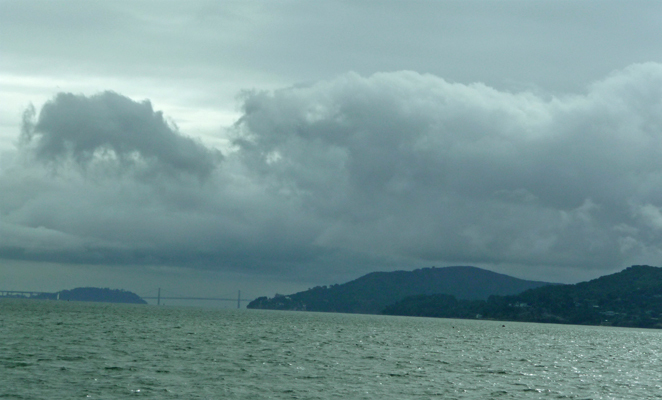 It was a little wet so visibility wasn’t primo but I still captured a photo of the bay as we drove over towards the Richmond Bridge. That’s the Bay Bridge off in the distance. 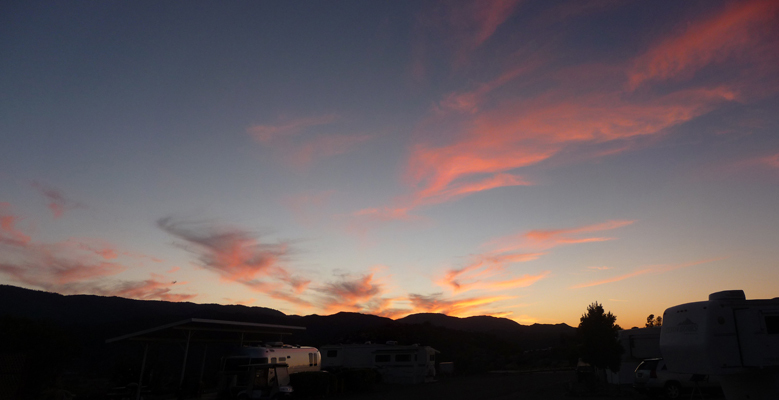 We drove southeast through the rain into the Central Valley and down to the Santa Nella RV Park in Santa Nella, CA. There’s nothing important in Santa Nella but it’s a good stopping point for us since it’s just about 200 miles from Santa Rosa. We had rain off and on that evening and there was standing water in the field next to the campground on Monday morning, November 9th, when we headed south once again. 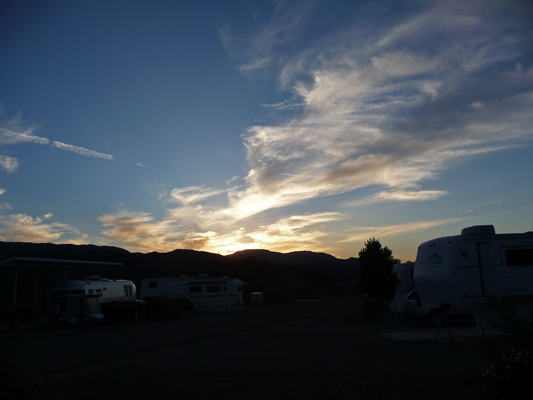 We drove just about 200 miles to Sierra Trails RV Park just north of the little town of Mojave. This is a Passport America park so we camped there for $20 (up from $12.50 last year). We had wind that night and the cap on our sewer hose holder spent the night clanging because we’d forgotten to screw it back on tight enough. It sure was nice to figure out what all the clanging was about come morning since we hadn’t been able to figure it out in the dark the night before. No damage done just a mystery solved. We’d seen snow on the north face of the Angeles Crest the day before and on Tuesday morning there was snow on the Tehachapi Mountains to the west of us where there had been none the day before. 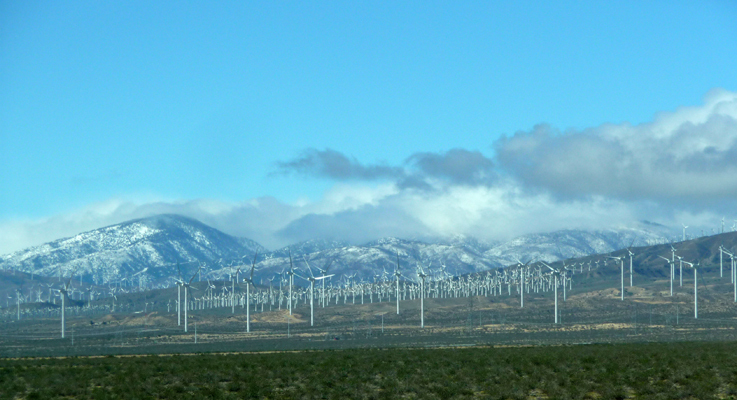 There is a forest of wind turbines from here all the way over Tehachapi pass. 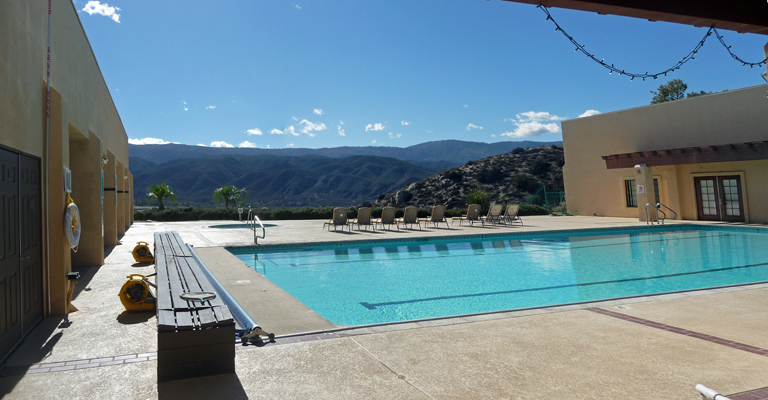 We continued eastward and then south down through San Bernardino and Riverside to Temecula (just north of San Diego) and then east just a little to Aguanga and the Jojoba Hills SKP Resort. We stayed here last March and enjoyed it so we decided to give it another try. It’s an Escapee Co-op so it only costs us $23 a night to stay in a wonderful resort with a pool, hot tubs, great laundry facilities and a large private lot to camp on. Our spot this time wasn’t as nicely landscaped as the one we got last spring but it was nearer to the club house and the pool so had it’s positive points too. We had hoped to move down to Santee Lakes Regional Park for the weekend (so we could be closer to our daughter, Tracy) but it was completely booked for the weekend. There seem to be more and more folks out on the road these days competing for camp spots. It just means that we have to plan ahead when coming into San Diego. The weather at Aguanga was wonderful. Sun with temps in the low 70’s during the day with lows in the mid 30’s and 40’s at night. On Wednesday Nov. 11th, we did laundry (you just stop by and sign up for a time slot and the whole laundry is yours for that time). Walter went on over to the book exchange to trade in some of the books he’d picked up along the way but had now read and pick up some new ones, while I swam laps in the gorgeous sunshine. When it came time to put the clothes in the dryer, I padded back to the laundry and then moved to the hot tub for a nice soak before getting dressed in time to fold. Now that is luxury! That evening there wasn’t much of a sunset to the west but the hills to the east lit up nicely. Thursday November 12th, we drove back down the hill to Temecula to do errands and shopping. 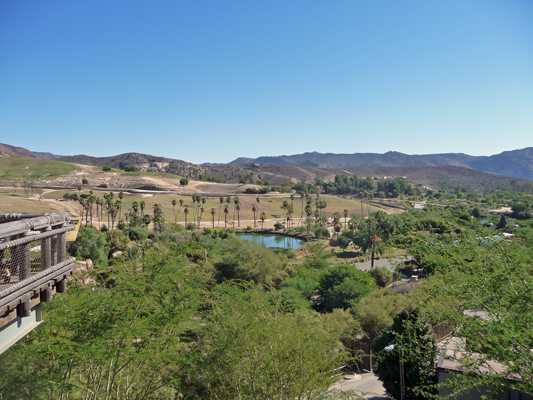 Temecula has all shopping you might want—Costco, Trader Joes, Sprouts, several varieties of grocery stores, a large mall with all the usual stores and several other smaller malls too. The traffic was pretty heavy even in the middle of the day but hey, we got LOTS done and still found a nice little park for our picnic lunch. That evening we had a few wispy clouds come to provide a nice sunset. It started with pearly pink. And proceeded to a lovely full pink all over the sky. Friday November 13th, we had a quiet at-home day. I swam laps in the pool while Walter joined a Blue Grass Jam that was meeting in the pool area. When I was done with my laps I joined them for a while too. The pool area is really lovely and a great place to swim or just hang out. We drove into Temecula that evening and met Tracy for dinner since she works in Temecula. We even found a restaurant that was close to her work so it was hardly out of her way. 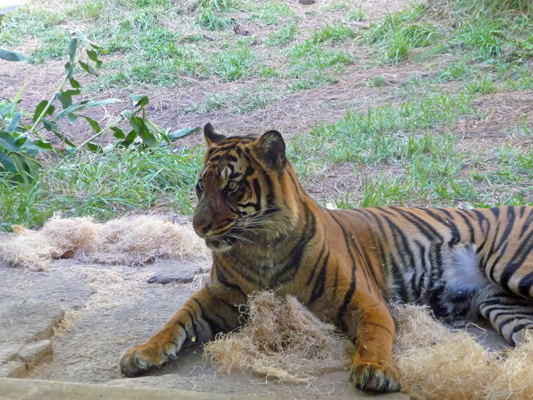 On Saturday morning we met Tracy at the San Diego Zoo Safari Park in Escondido which is about an 1 1/4 hour drive from Aguanga and only about a 1/2 hour from Poway where Tracy lives. This is a favorite place of all of ours and we had a wonderful day. 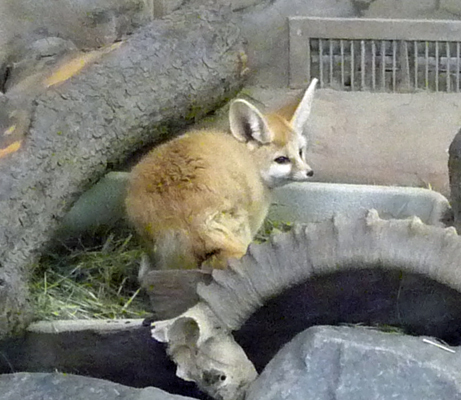 We started out with the Nursery where we got to see several young Fennec Foxes. Grandma, what big ears you have! 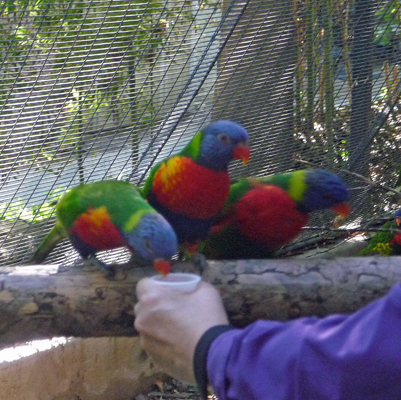 Then we took a detour through the Lorikeet display so we could watch folks feeding them nectar. You know me, I’d rather take photos of birds than feed the critters myself! 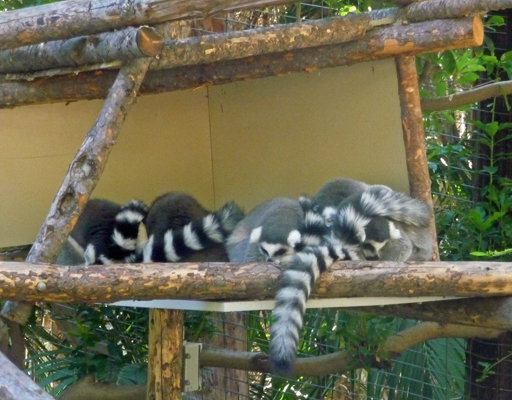 The ring tailed lemurs were awake as we passed by so we detoured to walk through their enclosure. And of course by the time we’d managed to get through the hand washing and double door passage they’d gone back to sleep. Then we took the Safari Tram that goes out into the main acreage of the park. Years ago there was a monorail that took you on a full circle of the park but it has been replaced with trams. 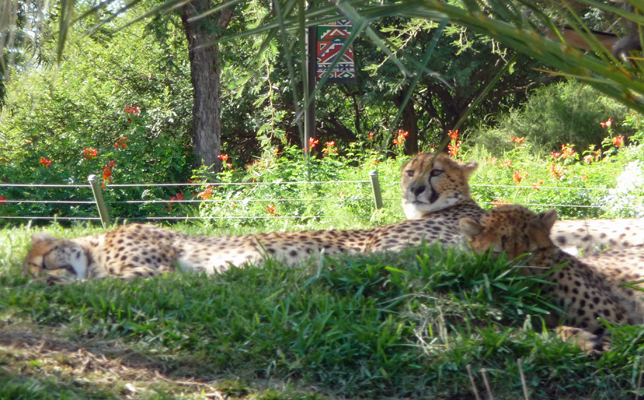 The first stop was a lovely pile of 4 young cheetahs with one who even deigned to have his head up to watch us go by. 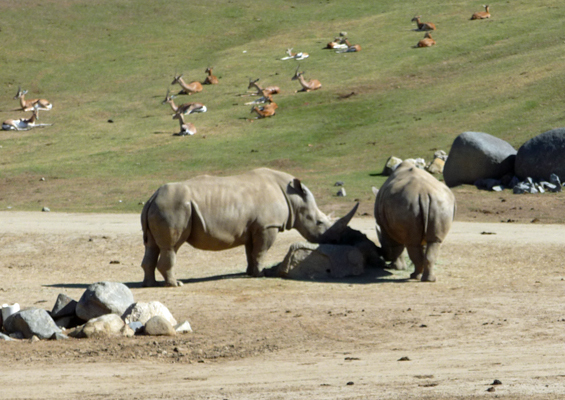 Then we moved on to the usual favorites: Rhinos. Back when the park first opened in the 1970’s captive breeding of rhinos was one of their main focuses. Now they’ve produced so many baby rhinos they don’t even talk about that any more! (Except of course for the problem of the very endangered Northern White Rhino. 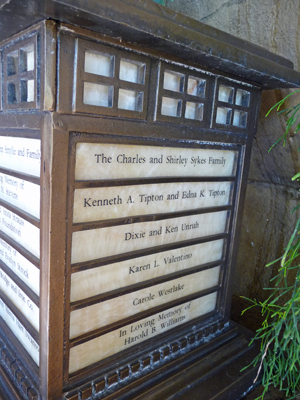 They didn't talk about it but one of the 3 left in the world was ill while we were there and died soon thereafter). 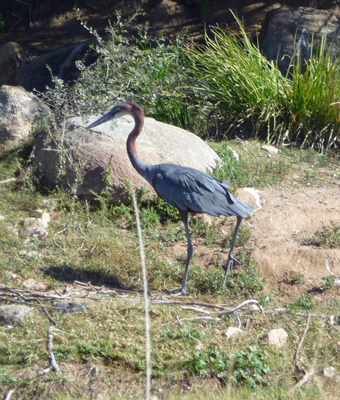 Here and there we stopped to look at exotic birds (whose names I promptly forgot). 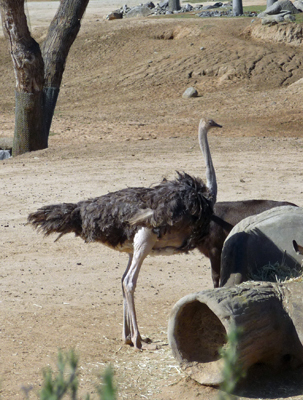 But you can’t forget that this big buy is an ostrich. 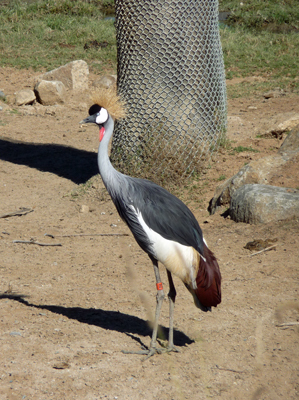 There were several grey crowned cranes too. There are tons different antelopes on this drive and this time I kept myself from taking shots of every critter we saw. But I couldn’t resist the giraffes. 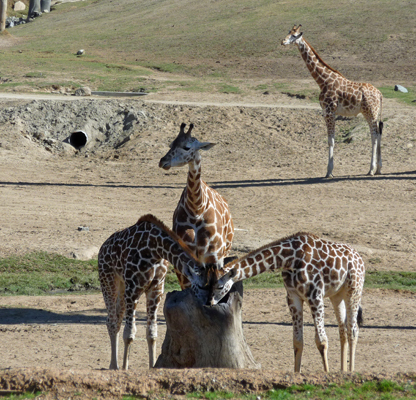 Here we’ve got 3 young giraffes (each a different age and a different height). When we got off the tram we noticed that there were more folks than before over by the lions. Sure enough, they were awake and I managed to get both a male and female together before they wandered off. We hiked back up the hill and took the elevator to the upper level and stopped to take in the view across the park. Even with the drought, it’s a gorgeous place. 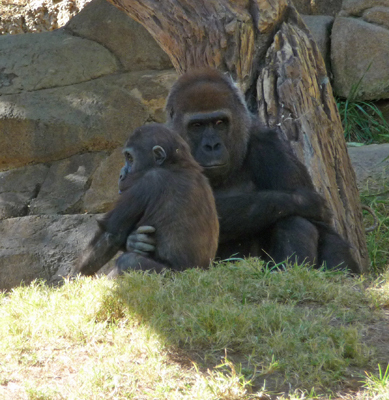 We stopped to reconnoiter and decided that we’d hike up and visit the gorillas. 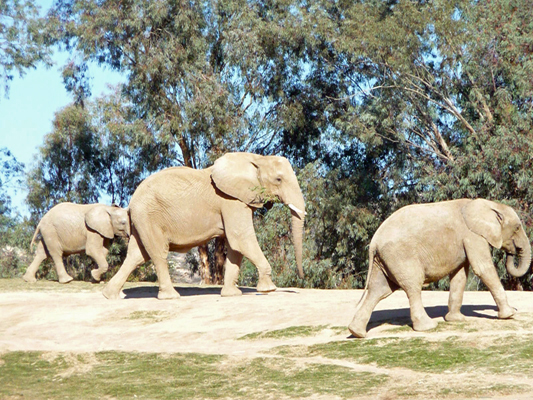 A mom was out with her baby and another youngster. 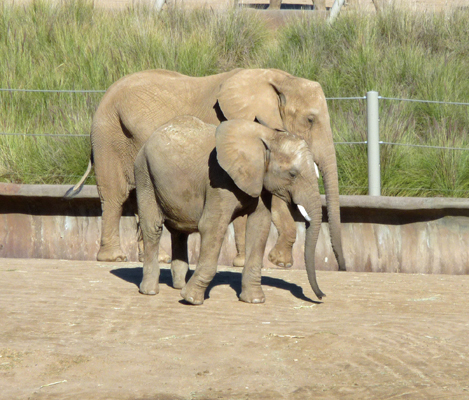 Periodically the youngster would run at the mom full tilt and she’d wrestle with him. They were a riot. 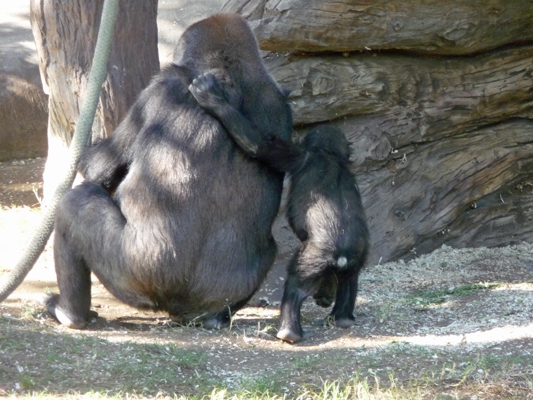 Meanwhile the baby stayed close to mom. For a while she carried him on her back but in the end she got him to crawl back down. On our way back down to the center of the park we passed the flamingos. When we arrived they’d been asleep with their heads tucked under their wings but this time they were out posing nicely. 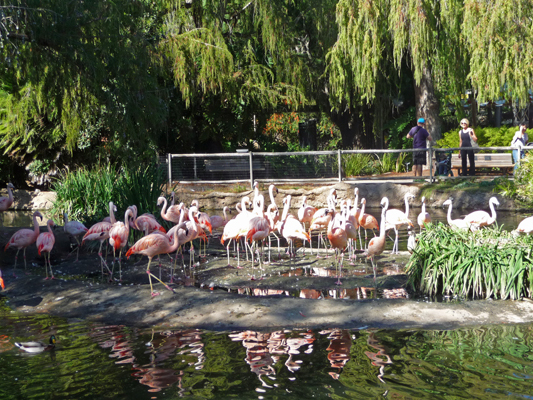 A trip to either the Zoo or the Safari Park is not complete without a photo of the flamingos. 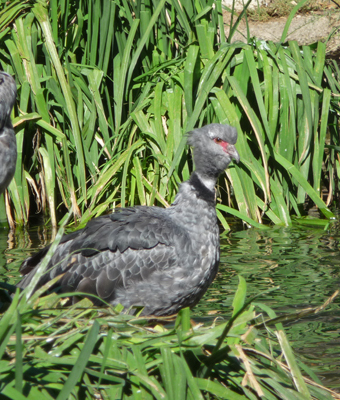 In amongst the flamingos was a bird called the Crested Screamer. With a name like that I HAD to have a photo. 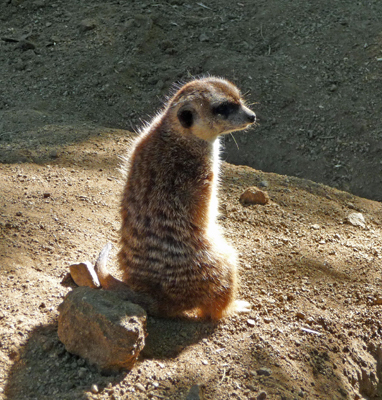 The Meer Kats were out too. From here we hiked up the hill to the new Tiger habitat. 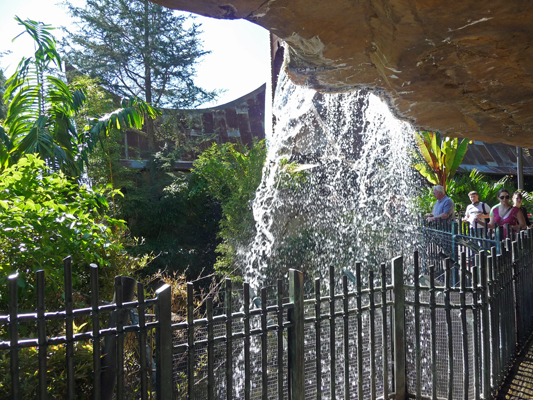 This is a marvelous new area with great landscaping and even a waterfall. Tracy’s (and now our) friend Karen Valentino (who sadly we didn’t get to see this trip) made a donation towards the building of this new area and got her name on a lantern! 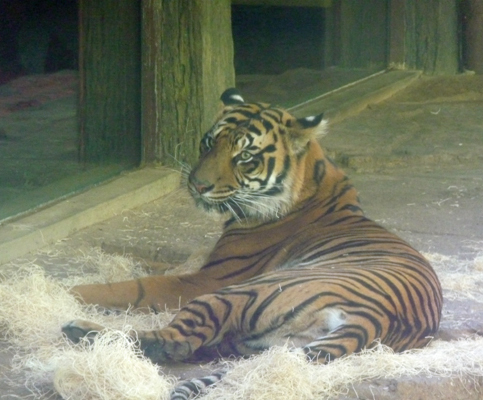 One of the tigers was out right next to the glass in the viewing area. When I went around the other side, I managed to get an even better view by sneaking my camera past a divider into a private dining area. I say, it pays to be sneaky. 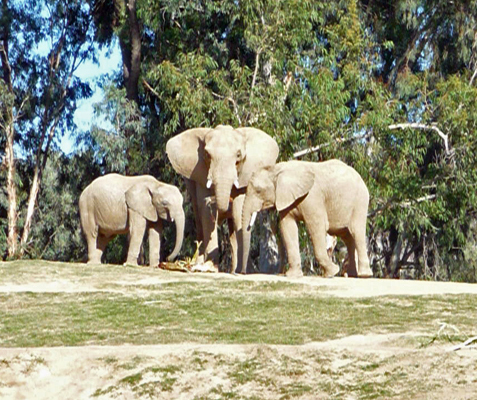 We had lunch and then set out to visit the elephants (one of my favorites though I have to admit I love them all). 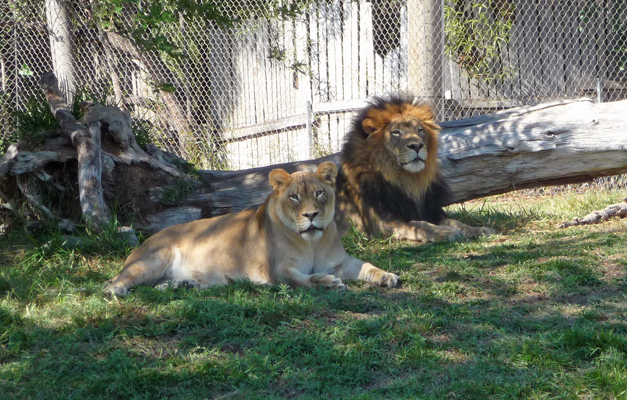 In one enclosure there were just a few, including this lovely pair. But just up the hill there were lots more. 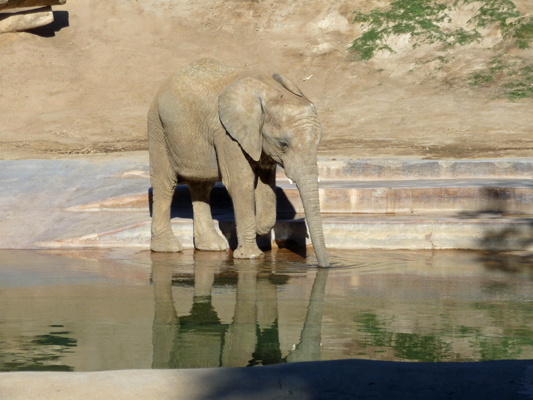 Plus a baby who came down to the pool for a drink. 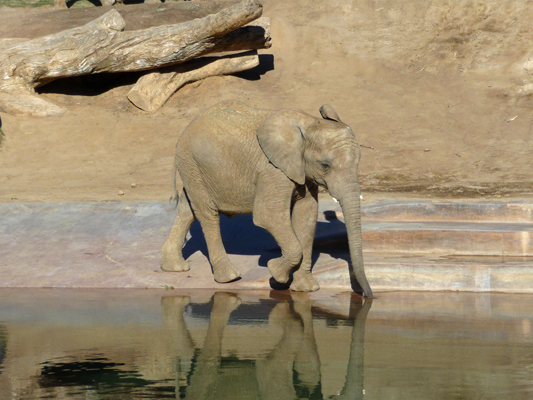 He played in the water some and put his trunk way further into the water than the adults do. 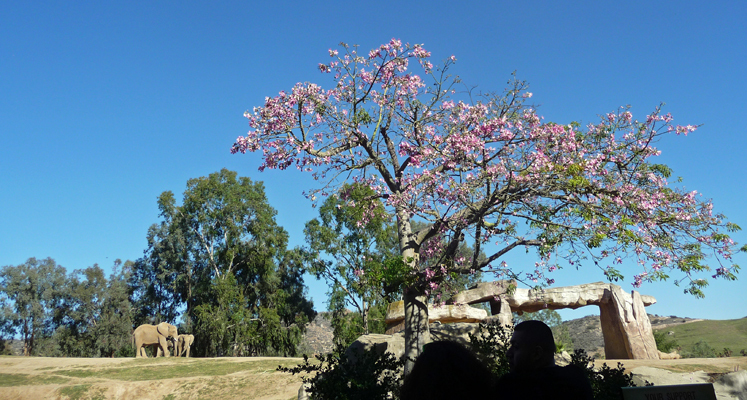 There was an orchid tree in bloom in their enclosure too. 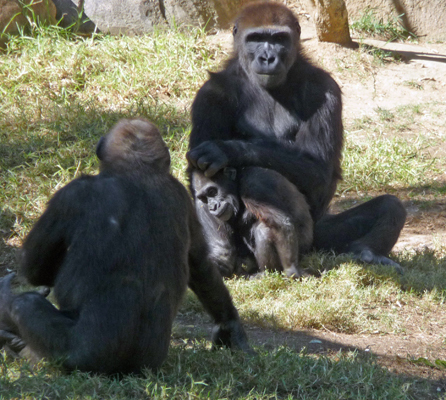 We settled down on a bench in the shade and enjoyed ourselves visiting and watching them. 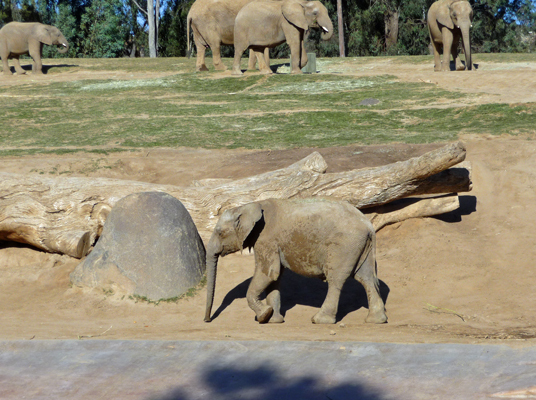 The baby came back later clearly having been in playing in the mud. Late in the afternoon we headed back to Aguanga and Tracy headed home to get ready for a concert in San Diego. We were all tired but happy. 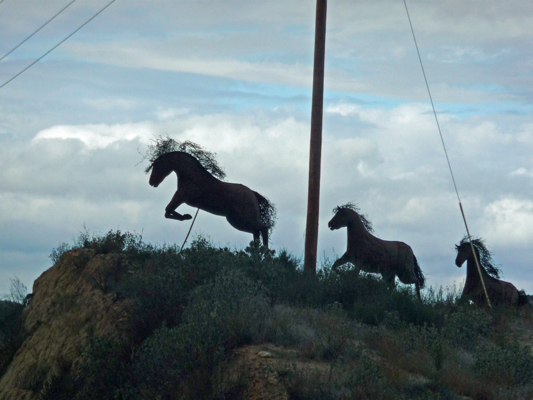 Sunday as we drove into Temecula I managed to catch a half decent photo (through the windshield and going 50 MPH) of some of the horse sculptures along the road. There are three on the north side and then on the south side yet another who has clearly successfully leapt the road. Further along there are dinosaurs and more horses. My guess is these were all done either by the fellow who did all the sculptures in Borrego or his students. We spent Sunday hanging out with Tracy at her house. It was a nice low key way to spend the day since all of us were just a bit tired from our busy lives. Monday it was cool (in the 50’s) so I skipped swimming in the outdoor pool while I did the laundry and instead Walter and I used the cardio equipment in the gym at the resort. They have nice treadmills and recumbent bikes along with lots of weights. It’s the best gym I’ve seen at any of the RV parks or resorts we’ve stayed in. After a soak in the hot tub in the sun and a nice hot shower, the laundry was done. Is this the life or what?